The MiniMed Paradigm Revel System is their second generation integrated system. 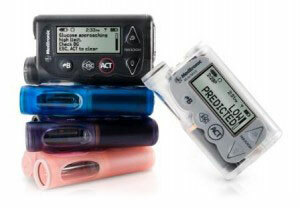 The system is setup to work as a standard insulin pump or with the Medtronic Continuous Glucose Monitor (CGM). The 2 devices communicate wirelessly. The CGM sends readings to the Revel pump every 5 minutes. There are two versions of the Revel, with the difference being the size of the reservior they can accomodate. The 523 uses only a 1.76 ml reservoir, while the 723 can use either 1.76 ml or a 3.0 ml reservoir. What are the pump's features? The MiniLink REAL-Time Transmitter attaches to your body separately from your infusion set and connects to the glucose sensor. The transmitter wirelessly sends glucose data from the glucose sensor to the insulin pump where it is updated and displayed every five minutes. The transmitter has a self-contained rechargeable battery that alerts you when it's getting low. The transmitter must be within 6 feet of the Revel pump for values to be continuously sent. An alert lets you know if you get out of range. 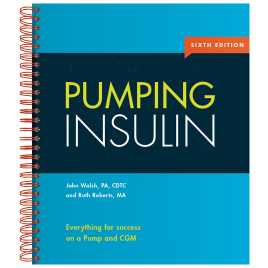 If the pump and transmitter are out of range for an extended amount of time, the transmitter can hold up to 40 minutes of data. This data will be uploaded to the pump once they are back within range of each other. The MiniLink REAL-Time Transmitter and Charger both have a 6-month warranty. Integrated systems are great. It makes it easy to get help since all the parts are made by the same company. Having all these systems connected together can only make it easier for you to gain better control.